Prof. Partha Pratim Goswami obtained his M. Tech degree in Applied Physics from the University of Calcutta, Kolkata, India, in 1981. 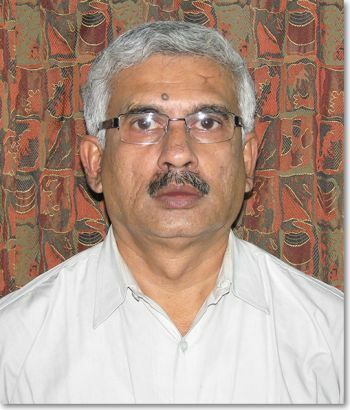 Subsequently he joined National Instruments Limited, a Govt. of India Undertaking, as Junior Technologist. Working there for a period of 15 years, he joined University Computer Centre, University of Calcutta, as System Analyst in 1996. Then he worked, as System Analyst, in Controller of Examinations, University of Calcutta, during the period from 2002 to 2006. During the period from 1996 to 2005 he started research in the area of Computational Geometry and obtained, in 2006, the Ph.D. degree in Computer Science and Engineering from the University of Calcutta. Title of his Ph.D. thesis is "New Variations of Proximity and Clustering Problems on Two Dimensional Point Set". Subsequently, in 2006, he joined as Assosiate Professor in the Department of Computer Science and Engineering, University of Kalyani, Nadia, India. He joined as Associate Professor in the Department of Radio Physics and Electronics, University of Calcutta, in the year 2008. Currently he is a Professor in the Department of Radio Physics and Electronics. His primary research area is Computational Geometry. He published 28 research papers in various international journals and conferences. Apart from research, he has lectured in various seminars and workshops and toured extensively varoius institutes all over India lecturing on various topics on Computational Geometry and related areas as part of the Research Promotion Workshop sponsored by National Board of Higher Mathemathics (NBHM), Govt. of India, and organized by Tata Institute of Fundamental Research (TIFR), India.